As less than 40 animal rights activists came together to denounce animal researchers a rather bigger crowd began to grow on the other side of the road. Shouting chants like “Stand up for Science! Stand up for Research!” this group, with almost 20 minutes before the scheduled start of the rally, began to grow. One hundred. Two hundred. Four Hundred. By the time we reached our final destination we numbered around 800 people. Making their voices heard, scientists and students marched along Westwood Avenue up to the Court of Sciences in the heart of UCLA. At the Court of Sciences we heard inspiring words from researchers and administrators alike who added their voices to ours. Professor Lynn Fairbanks spoke of her son (Type I Diabetes) who’s life has been saved by the animal research that went in to developing his treatments. Dr. John D. Young went as far as to say that if there was any use of animals that can be described as vital to humans, it was the use of animals in research. It was amazing to see the energy run through the crowd – and I thank everyone there for being a part of it. It was also announced that the Californian-based Pro-Test Petition would start accepting names of people who believe in research. Go sign it now. 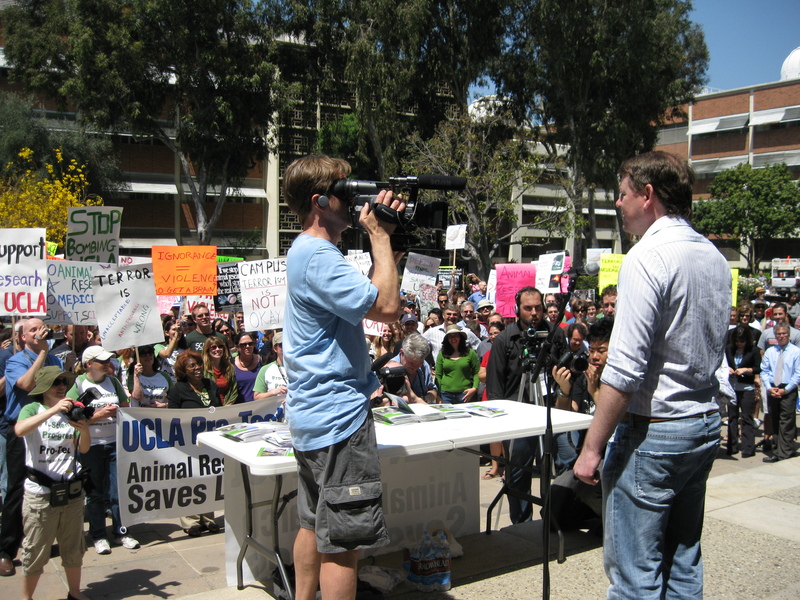 The rally at UCLA showed the best side of the researchers and individuals who support biomedical research and forcefully made the case for the benefits of biomedical research conducted on our campus. This is the beginning of a forwards-looking process that we hope will successfully counteract the environment of fear caused by extremist attacks. Posted on April 22, 2009 October 6, 2013 by EditorPosted in Campus Activism, News, SR NewsTagged 22nd april, animal rights activists, april 22nd, ceders-sinaii, court of sciences, david jentsch, holder, jentsch, john young, lynn fairbanks, no more threats no more fear, photo, photos, pro-test, Pro-Test Petition, stand up for science, Tom Holder, ucla pro-test. This is my rather long winded and indirect contribution to Pro-Test: Friendship, grief, anarchy, fine dining, and random gunfire. 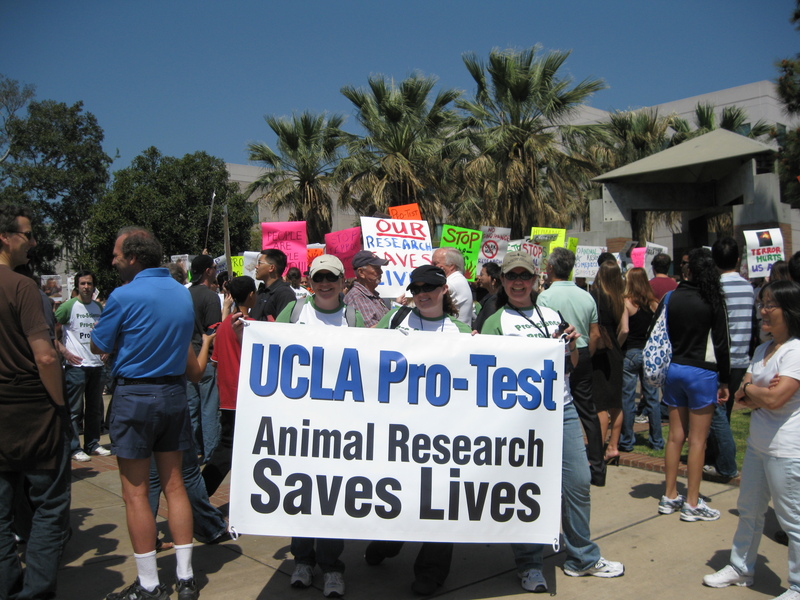 There’s an interesting item in the Daily Bruin about the Pro-Test UCLA rally. Now this is actually true, human stem cells do have tremendous potential for the development of far better in vitro screening methods (which typically use human or animal cells that are derived from tumours) for fields such as toxicology, and for the early stages of screeing potential anti-cancer drugs. But he seems to have forgotton the absolutely crucial role played by animal research in studying stem cells and getting the field to the point it’s at today, regardless of whether you’re talking about adult, embryonic or iPS cells. We’ve discussed this several times on this blog and over on the Pro-Test science blog. And of course animal research is still crucial to ongoing studies that are teaching us more about how stem cells function, and how to manipulate them, and to the development and refinement of stem cell therapies. Masongsong’s opinions are typical of the blinkered views of many opponants of animal research, happy to agree with other scientists about areas where new technologies can replace or redude the need for animal research, but blind to the areas where it still plays a vital role and will continue to do so for many years to come. It sounds like I missed a great event, but at least I got to follow it live on twitter. Very cool!! At the risk of gushing I’ll say that today you guys made me proud! This was truly an amazing event. Inspirational. Courageous. As David said: “enough is enough” — and the UCLA community agreed in full force. We hope this historic day at UCLA will inspire our colleagues across the nation, officials from from NIH, private medical foundations, celebrities and members of the public, to finally stand up for Science, progress and humane medical research. Hooray for our team!! I’m sorry I missed the event but I was there in spirit. It was a day like no other I have experienced. I am proud to have taken part in this historic event! A big Thank You to everyone who had a hand in making this rally so successful. The courage to stand up against those who would stop our researchers from continuing their lifesaving work has finally been found. Let’s keep this momentum going!